Phoebus is a character that can fulfill many different niches. He can be a jerk or the love interest pending on the direction the version is taking. The 1956 version of Phoebus is different, he is a sort of jerk but he does in fact care. We first see Phoebus when he rescues Esmeralda from Quasimodo. 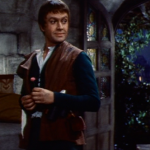 He is, naturally, instantly attractive to her and proceeds to take her to an inn. After he pays for the room Esmeralda runs off. This really doesn’t bother him all that much. The owner of the inn says that Esmeralda is too beautiful and wild which is the kind of woman Phoebus always dreamed of. So it would seem that maybe Phoebus and Esmeralda could have worked out in this version if things had gone differently. I mean, yeah, he is engaged to Fleur de Lys and he seems to like her enough. But Phoebus does tell Quasimodo that he wished he could have saved Esmeralda. So he does care for Esmeralda even if he is going to be with Fleur de Lys. I could be reading into this a little too much or maybe I’m giving this Phoebus too much credit but it seems to me that Phoebus might have chosen Esmeralda and merely just settled for Fleur de Lys. I think if that was made more apparent in the film it would have given Phoebus a bit more pathos which makes sense as this movie has Anankh has its basis. Plus it would make the audience connect more to him. However as it stands, two lines makes Phoebus a deeper and more interesting character than Esmeralda, Quasimodo and Frollo which is sad but still two lines isn’t enough make him sympathetic.